In my early days of being a bright-eyed foodie (yes, I still am), we went to Rose Pistola restaurant in San Francisco. It was a fantastic meal with the perfect ambiance, attentive service and quality food. It’s funny though – I can’t remember what I ordered for dinner because the salad struck a chord with me with its simple yet intriguing flavors. Made with rocket (also known as arugula), persimmons and toasted hazelnuts, the salad is dressed with just hazelnut oil and salt and pepper (hazelnut oil is light yet has a heady, rich nutty aroma). Until recently, I would only make the salad when persimmons were in season – a few short weeks here – and sometimes the season would come and go with me lamenting that “I missed the Rose Pistola salad again this year!” While persimmons are a sweet and unique fruit to use, I started using mangoes so we could enjoy this salad almost any time of the year. 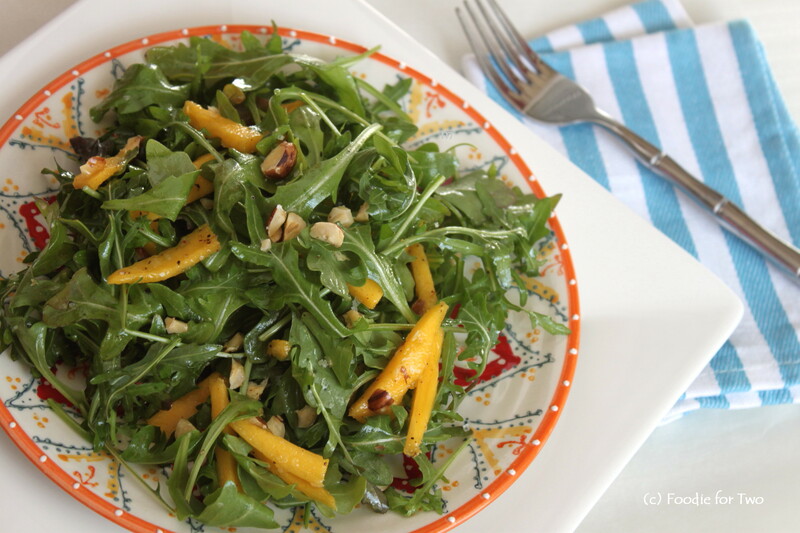 They are a dandy substitute; the sweet fruit plays beautifully against the spicy arugula leaves and the nutty flavors from the hazelnuts and oil add another dimension of flavor. In this rocket salad, the simplicity of the flavors shines through – another wonderful food memory re-created at home. Add the rocket/arugula leaves to a large bowl and drizzle lightly with hazelnut oil (about 2 or 3 teaspoons), along with a scant 1/8 teaspoon salt and a good pinch of pepper. Gently toss to evenly coat the leaves; you want just enough oil so the leaves glisten. Add the mango slices and chopped hazelnuts and toss together. If needed, add more hazelnut oil to taste. Mound the salad on two plates, add a pinch of sea salt on top and serve immediately. 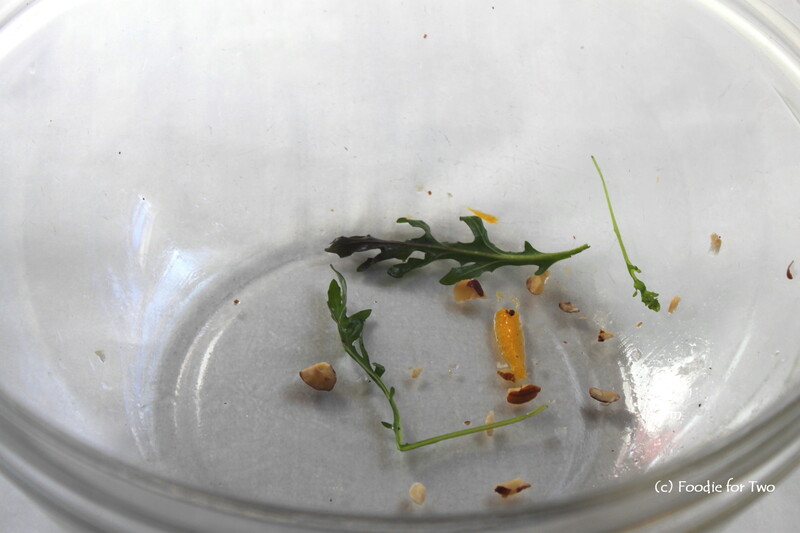 This entry was posted in Salad and tagged Baby Arugula, Fresh Cracked Pepper, Hazelnut Oil, Hazelnuts, Mango, Persimmon, Rocket, Rose Pistola, Sea Salt, Simplicity. Bookmark the permalink. Hi, Jackie! Thanks for stopping by. You have so many delicious dining choices in the SF area and I’m sure it’s hard to hit them all. Cheryl raves about your quinoa patties and I look forward to tasting a batch. Cheers! LOL! Always love introducing new stuff to the Bergman foodie family! This looks wonderful! A must have for lunch. It was my lunch on the day I took the photographs, which made me even hungrier having to stare at the food of plate before I could eat it! Just love the contrast of flavors – spicy, sweet and nutty. Arugula – one of my favorite greens! I believe you made this one summer when I was visiting and it was fabulous! 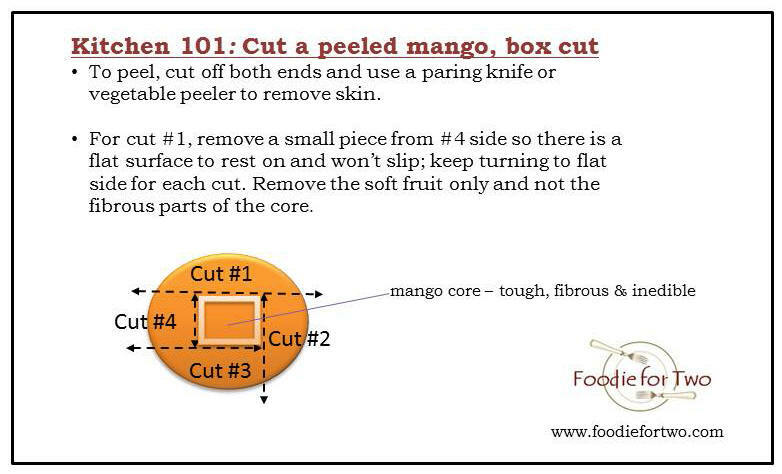 Great visual on cutting the mango. Normally I would have given up for lack of know-how. And the hazelnuts…..I’m drooling! Glad you liked the mango cutting visual, and that it will nudge you to give it a try in the future! I have been eating arugula on my sandwiches lately, and love the spicy crunch it adds. Speaking of spicy crunch, I tried sunflower sprouts for the first time at the City North Farmers Market. They look like bean sprouts with regard to size, but taste a bit nutty and have a ever so slight “peppery-ness” (did I just make up a word?!). Since I haven’t located pea shoots to top my quinoa patties or hummus/avocado toasts, I’m going to use these…..10 days and counting!!! !